I am devastated. I ran my second marathon last weekend. I ran a spring marathon as well, but at about the 19-20 mile mark my legs cramped up... I could barely walk! Struggling along I crossed the finish line in 4 hours and 16 minutes. This left me with a very bad taste in my mouth. You can't call that struggle "running a marathon"! Last weekend's marathon I was much better prepared. My average mileage during my training was about 45 to 50 miles a week and I managed to run three or four 20 milers (7:40 - 7:50 pace). Because of the training I have also lost quite a bit of weight (down to under 160 pounds). Again a disappointing time and again without the feeling to have actually "run a marathon". Why is this happening? How can I change my training approach so I can run the marathon, preferably in less than four hours? Yes, answer by Marius, not by Dominique this time. I asked Marius Bakken, two time Olympian and author of The 100 Day Marathon Plan to answer this question. Apart from being an elite runner, Marius has trained with elite runners from Kenya and Italia and has adopted some of their training methods to create a marathon training approach that helps you run smarter and helps you achieve your goals. What most marathon programs do is to start off marathon training from "day 1" in the program. A lot of runners aren't ready for this at that time and what usually happens is that they see a good improvement over the next 4-6 weeks before performance levels out. Now, what all the top gun marathon runners do, that works really well for even beginner marathoners as well, is to use periodization in their training. This means that you don't hit marathon specific long sessions until later in the schedule. And when you do, just running 2 hours easy runs is not enough if you want to stay out for 4 hours in the marathon! Instead, I encourage special "run/walks" that work fantastic for building strength over the last 10k/6 miles of the marathon - and these can sometimes last up to 4 hours in duration. In 80-90 % of the cases this solves the problem with "hitting the wall" over the last part of the marathon. The remaining % is a matter of proper pacing (I always recommend runners to do a half marathon exactly 4-5 weeks before a full marathon and use a calculator I have made to find their marathon finishing time) and teaching your body to take up nutritions. Many are not aware of the latter, but you can actually increase your ability to take up fluids to a large extent if you do this correctly in training before the marathon. 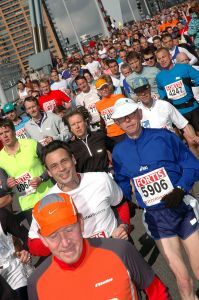 The result is a 30-40 % higher absorption of carbos during the actual marathon which will help you over the last miles. In addition to this, you have to balance your training out. I'm a big fan of running smarter in workouts and not just more. Most of the runners I have on the 100 day marathon plans take huge jumps in their finishing time with spending only as much time running as they already do, or even less ! The "no pain, no gain" training without a clear periodization will get you to the finish line if you stay injury free, but a smarter approach will always get you there faster. Combined, this should solve the problem over the last 10k / 6 miles, it is not really hard but in the marathon you have to get all the details right to make everything click perfectly over such a long distance. And thank you Marius for such a detailed answer. Marius' book, The 100 Day Marathon Plan, is a really good guide to modern running done by Olympians. Marius has trained and worked with elite runners from all over the globe. He has learnt how Italian runners got to win the Olympic marathon in 1988 and 2004 and how the Kenyans have come to dominate the world of long distance running. He shares a lot of his knowledge in his book. His book is aimed at the marathon, but it is clear that his training principles work for other distances as well. Highly recommended if you want to run a marathon and want to do well! Click here for more information about The 100 Day Marathon Plan.